I hate email. But there’s one thing I hate even more: people selling my email address. Currently trending at the top of Product Hunt, Pressfarm is an email database for tech journalists — and it’s not free. After creating an account, you can pay $9 a month to get access to a curated list of email addresses of people working for publications such as Business Insider, Re/code, The New York Times, The Wall Street Journal, and, yes, TechCrunch. With a free account, you can only see the names and Twitter handles. In other words, keep your credit card handy if you want the 214 email addresses. This is nothing new. Countless people have been selling email lists on the Internet. Most of the time, you can get thousands of email addresses for very little money. But Pressfarm is different. It’s a slick website built using the Bootstrap framework and Stripe with a well-tailored list of journalists. It doesn’t look like your average shady website for pro spammers. Yet, you don’t have to pay to get our email addresses. You’ll find them at the end of this post for FREE. But that doesn’t mean you should spam us for coverage. 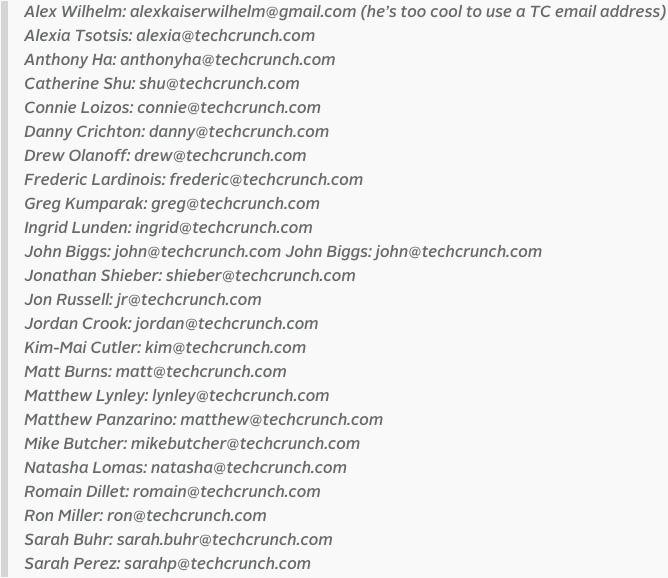 As TechCrunch’s Sarah Buhr commented on Product Hunt, don’t send out mass emails. These emails don’t work — we skip them. Instead, find out who tends to cover your startup’s beat area of opportunity, and reach out with something short and sweet. Don’t pitch too early, tell a story, and build relationships. Finally, don’t take it personally if we don’t cover your startup — there are so many good things out there that it’s hard to keep up with everything. And without further ado, here’s the list. Go buy an ice cream or two with your $9. List updated on July 14, 2015.